Facebook is a popular social media portal to share updates and useful links for friends. 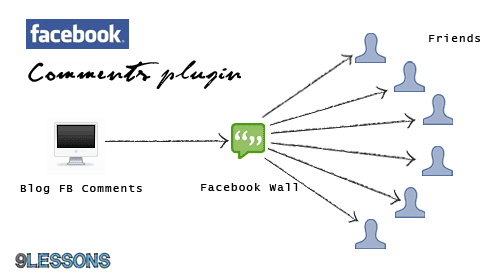 This post explains how to integrate Facebook comments plugin script into Blogger and Wordpress blogs. Just few lines of code, I feel it's very useful for generating blog traffic. Copy and paste the following code below the line above. Not working with me on local server wamp.........why? Good and very useful for bloggers out there. But the styling can be improved a bit to suit the templates of blogs. do you know you're awesome !? with my ID number and copy and pasted it as you've instructed. aww. APP_ID is your FB-application ID number. You need to make an application to get one. It's not profile ID. Después de mucho darle, he conseguido subirlo al blog, pero necesito alguna “llave” para que sintonice con cada post. Es decir, me aparece en la sección de comentarios pero no en el post que se supone comentamos, sino en todos. Es un pequeño detalle pero hasta que no de con él no me lo reconocerá. Excelente !!! enconstré aquí la solución a los comentarios repetidos en los post. Gracias !!! Doing this prevents the full functionality in particular the ability to select between your profile or a page profile. Do you know how it can the comments separate on every post, instead of the way its now: If you comment on one post, it appears on all of them. Do you understand? Thanks for sharing about this!! Will be interested if you write anymore? My single.php does not have the line of code mentioned above. Could it be on another page? Any help on where to integrate FB comments would be appreciated. Thanks! It's written in Chinese Traditional , but I think you guys can understand the code easily! want to try this tutorial..
How to receive notification when someone posted in our FB Comment Box. My blog is Blogger Blogspot. Any idea? how does one link this so that comments made on the blog show up on my wall, and vice versa if someone comments on a wall like, the comment shows up at the blog post? Is there a way to set it up so that it is independent of the comments 'div'? meaning, it appears by default at the bottom of each post? Thanks for the tip how to uise the code without the API ID. great!.. somebody know how to hide the like button and the faces? Thank you! This entry is very useful! Sorry, a temporary error has occurred. Please try again. i;ve done everything. WHY? Wow, finally I've found the working one. color because I have a dark background? The best Facebook comments plugin for blogger on the net! And the easiest to implement! Hello. Is it no answer for my question ? please guide me . I dont know why facebook comment Appear in Every Post that i had done. The SAME comment appear in EVERY post in my blog . I need solution . Please . You have to differentiate with "data:post.id"
By put Post ID, thats mean facebook comment box ONLY show in specific Post rite? i want to show in EVERY post(different comment).. so how should i do? Do you happen to know how to show the FB Comments only on certain pages with a WP.org site? I'm using Genesis theme. Hi there! Thanks so much for the great post. Will I receive notifications when someone posts? I haven't been receiving any. Is there somewhere to activate this? I can see on my stats that people have viewed my posts through the plugin but I don't get notified. How can I fix this? hi, i'm very thank you for this post. i was search and try many tutorial but NOT working as well as so many copy and paste. this is most simple (2 step only) code but working perfectly on blogger. i will recommend this. thanks again. now you may also can comment on my blog. I used your tricks but still I am not getting result. "The comments plugin requires an href parameter." thank you, I have been looking for it for 4 days now, and i did it eventually thank u, but i still need it light not dark what can i do? However, as I looked into developer.facebook.com, the code for comment box is quite different. By the way, I am user of blogger.com, though I have used a custom domain. need to have it in light not dark to fit and be visible with my background... any help ??? First time i come to you through google search. I already installed a Facebook comments plugin but it is not compatible with WP 3.2, let me try this one too. I was in search for this fb comment box. At least i found it..
Hi can you help me ? The blog in my Social network site (facebook copy ) is crashed and unrepairable. So i need a new blog can you tell me I need to use. Thanks for sharing this information. Very useful. Sir can this code will display in lightbox?